New Look! If you are familiar with our orange labels this is the same product. Made with a blend of more than 10 natural oils to help loosen scaly build-up. Formulated to moisturize, condition, prevent flaking and helps calm and soothe the scalp. Apply a thin coating with the easy application spout tip to your problem areas at night and shampoo out in the morning. 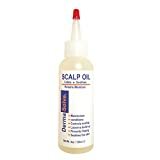 Gentle, steroid free, irritation & fragrance free formula is safe to use on scalp and body. Doctor recommended, best when used with Dermasolve Shampoo and Dermasolve Cream. Posted September 1st, 2018 in Psoriasis. Tagged: Buildup, Condition, Dermasolve, Flaking, Forumlated, Health, Loosen, Moisturize, Prevent, Psoriasis, Scaling, Scalp, soothe.